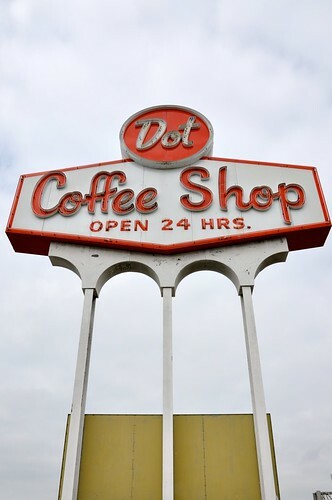 They say everything’s bigger in Texas, and if the size of the sign for the Dot Coffee Shop – and the quantity of food at our breakfast is any indication, they’re right! Located just off Interstate 45 in Houston, TX it’s been a landmark since 1967. 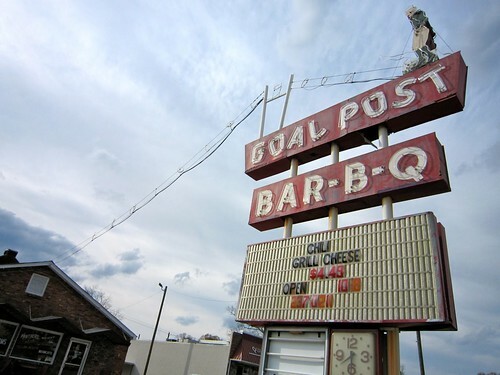 Animated Neon Sign, Barbecue and Icebox Pie – Warren’s Goal Post Bar-B-Q in Anniston AL Kicks! We came to the Goal Post Bar-B-Q in Anniston AL mainly because of the great neon sign, but will remember it for our tasty food! It’s hard to tell from the photo above, but the Goal Post’s sign is an animated neon sign, with the football player’s leg swinging back and forward to kick the lighted football. Multiple neon footballs are lined up in a row, and when they flash in order it looks like the football goes sailing across the small parking lot and onto the roof of this small brick restaurant. From the comments on my photo of Bubbling Brook in Westwood MA I know I’m not the only one with fond memories of this seasonal restaurant and ice cream stand nestled in the suburban greenery southwest of Boston. Open since 1951 from mid-May to Mid-September a visit to The Brook is a sign summer has begun! 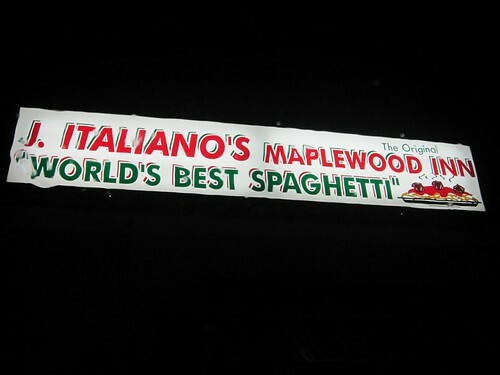 Joe Italiano’s Maplewood Inn Hammonton NJ – RetroRoadmap Worthy Spaghetti! Normally places on the RetroRoadmap have a vintage look or feel, but I’m declaring that Joe Italiano’s Maplewood Inn in Hammonton NJ is going on the map because of their great homemade spaghetti. They’ve been in business for 65+ years on the White Horse Pike, and are still family owned and operated too! 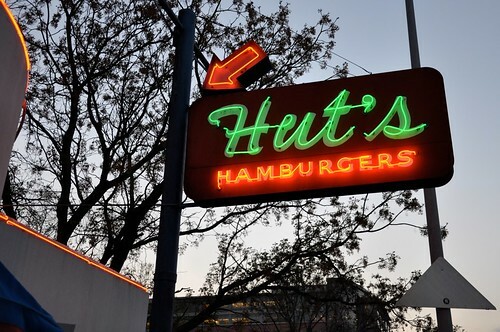 It was a happy coinkidink that our first stop in Austin TX was just steps away from Hut’s Hamburgers on 6th street – and bonus points for it being 2 for 1 burger Wednesday when it was time for us to eat between shows! As you can imagine Austin was pretty hopping during our SXSW visit and Hut’s was no exception. But folks were friendly, we found a place to sit and wait while our number was called, and that gave me time to peruse the layers of history, awards and funky finds lining the walls. 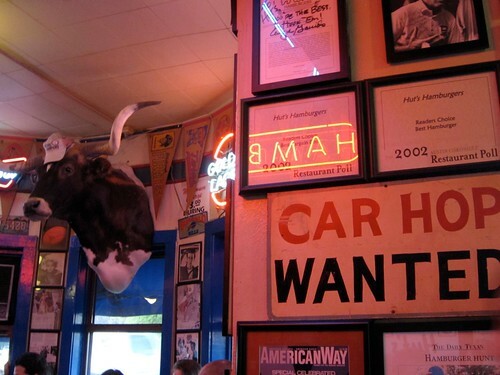 According to a sign on the wall, the building was built in 1939 and originally a Drive-In restaurant called Sammy’s, and went through various renames and restaurant styles before it was named Hut’s in 1969. Don’t worry, there won’t be a quiz! But one thing this tells you is that, in the quickly metropolizing city of Austin, Hut’s is one of the few vestiges of what old Austin was like. of course there’s more – read on! Hats off to George Motz’s book Hamburger America for hepping me to this hidden gem of a lunch spot – The Northgate Soda Shop in Greenville, SC. Up until we walked in the door I was curious if we had the right place, as it’s the corner anchor of a nondescript strip of storefronts tucked into residential Greenville, SC. But once we entered and saw that it was indeed a real soda shop with all the vintage trimmings we knew we had made it to the right place. 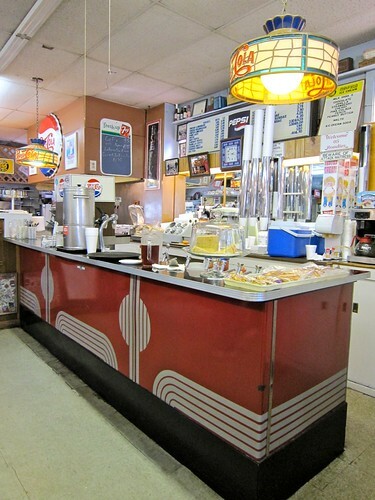 Originally opened in 1947, the soda shop look was preserved by long time owner Jim DeYoung who bought the place in 1965 . He owned it up until 5 years ago when current owner Catherine Christophillis took over and was smart enough to keep the decor and menu unchanged. 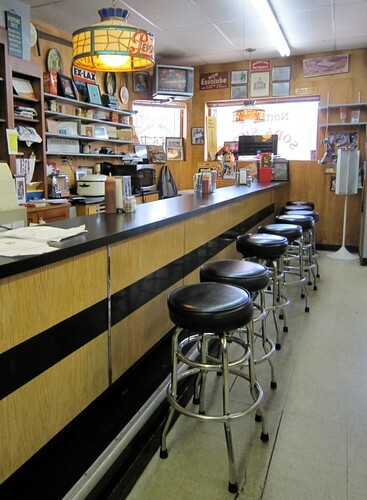 You have your choice of sitting at the vintage counter, or at one of the tables in the 2 small dining areas. We opted for a table in the corner – my fave place to sit, so I could take in the decor. 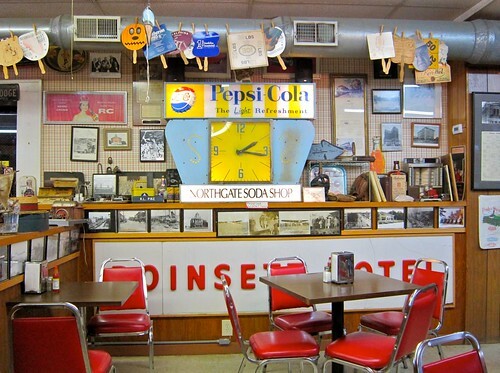 The shelves on the walls are laden with local photos and historic ephemera, and the Northgate is said to have one of the largest collections of historic Greenville photos around. Now I will admit I was a wee bit trepadacious (?) because my only experience with pimento cheese (a southern staple I’m told) has been out of one of those Kraft “swanky swigs” jars when I’ve made a retro-party-worthy cheese ball. RetroRoadhusband did not want to be nearly as adventurous as I and ordered a tuna sandwich. 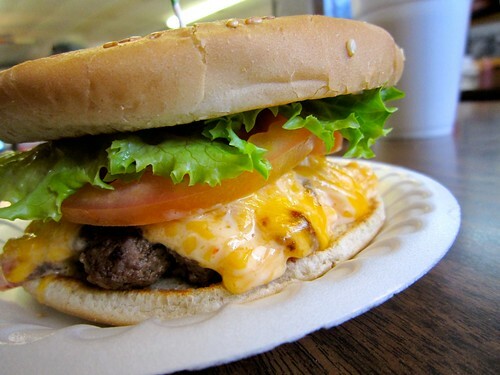 Well let me tell you- once I saw this burger I knew I made the right decision- in fact every time I look at this photo I begin to crave a pimento cheese burger. Just look at the way that cheese melts and oozes onto the grilled bun,, that bright green lettuce and red tomato, and the tasty burger patty peeking out underneath it all. The pimento cheese flavor was mild yet tangy, the burger was moist, and the juice and cheese combined to make a lovely seasoning absorbed by the grilled bun. I could not help but feel bad for RRH when he got his tuna sandwich. He loved it and all, and did not care for his bite of my burger, but why order tuna when you could have one of these burgers, at the place that is famous for them. Ah, to each his or her own. 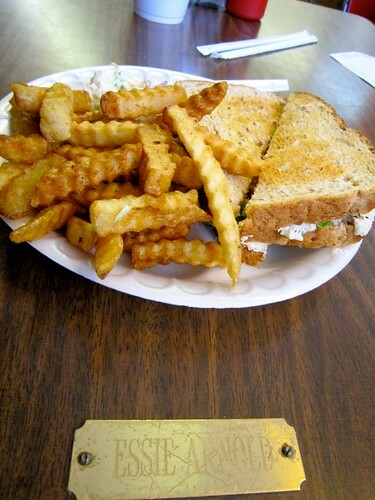 Here’s a photo of his tuna sandwich and fries – crinkle cut- my favorite kind. And it was cute to see many of the places at the tables and counter had been claimed by regulars, with a commemorative brass plaque. Thanks for sharing your table with us Essie Arnold! A family of six sat next to us and some of them later left riding a golf cart up the hill, much to the delight of the younger boy along for the ride. From our perch in the corner I could take close up shots of the ephemera, and also notice when a couple – probably feeling as out of place as we did when we first walked in – tentatively sat at the counter to order their food. I was glad that we only ordered one side of the fries, as the sandwiches were delicious and filling, but the only bummer being, once again, that there was no room for dessert from their assortment of baked goods and ice cream treats. As I stood near the art deco dessert counter I inquired about a delicious looking multi-layered cake under the dome and was told by the waitress that it was a, “carmel cake, or caramel cake, however you want to pronounce it”. I did not want to pronounce it, I wanted to eat it all up! But then I was reminded, at the door, that might not be a good idea. 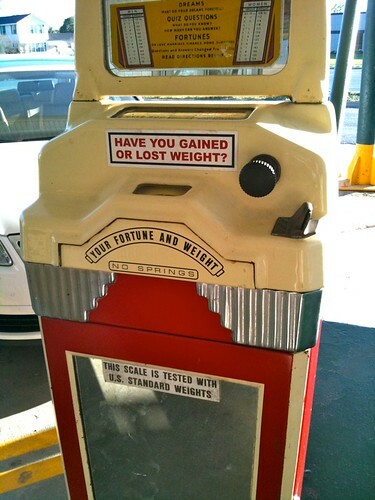 Whatevs, scale – I still fit into my clothes, AND into the RetroRoadmobile that we hopped into and reluctantly headed to Atlanta in. I wish we had more time to explore the Greenville area and many other places in SC, but am SO glad we took the advice of George “Hamburger America” Motz and ventured into the Northgate Soda Shop! Thanks To Social Media We Visited The LaPlace Frostop in LaPlace, LA #thankyou @Twitter! In the early days of RetroRoadmap’s Twitter account I was looking for cool and vintage places that might be using Twitter to promote their business. There were hardly any but when I saw the vintage root beer sign of the LaPlace Frostop’s Twitter icon I followed them immediately and we’ve exchanged friendly messages ever since. 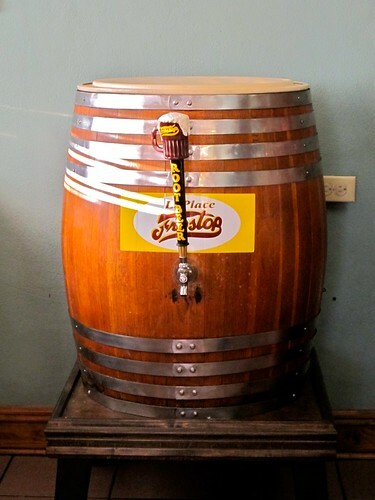 So, following the lure of their rotating neon root beer mug we headed south and were tickled to meet Frostop owners Jim and Terry Toler in person on our recent retro road trip. 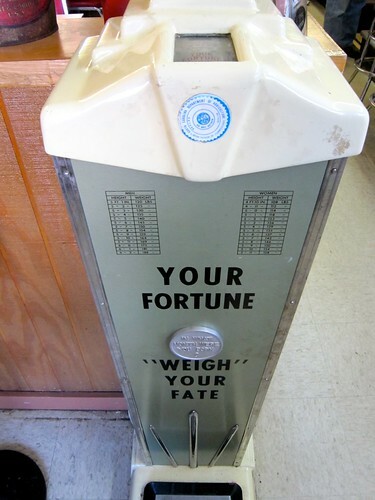 Seriously, wouldn’t you want to check out this sign for yourself? Here’s the video I shot of it as soon as we got there- yes I was “wicked psyched”! We made the right decision in “tweeting” ahead to see what time the Frostop closes, and barreled down the highway from Mississippi to get there before their 6pm closing time. When we rolled into their parking lot we were relieved to see that there were plenty of cars in the parking lot, and as soon as we went inside the restaurant we were given a friendly greeting from owner Jim and his daughter Terry, who is using her marketing degree and social media expertise to get the word out about the restaurant. As you can see from our experience, it totally worked! So glad to see modern advances can help drive business to a vintage destination. The friendliest of folks you’d ever want to meet, they chatted with us while gathering together a large order placed by a production company filming a TV episode of Memphis Beat across the street (click here to read the Frostop’s blog entry about THEIR appearance on Memphis Beat last summer and a recent photo shoot at the restaurant for the show as well!). As we alternately chatted and tried to decide what to eat, we learned from Jim that the Frostop had been around since 1958. Originally owned by his father-in-law, Jim bought it in 1973, and he and Terry currently run the restaurant. Though at one time there were numerous Frostop locations dotting the south and midwest, there are only a handful of them left today. And the pronunciation of their town is “la plass”. Noted! 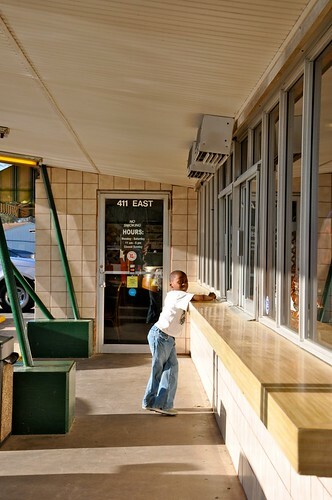 As you can see from the menus posted on the windows, the Frostop has a huge selection of items to order. 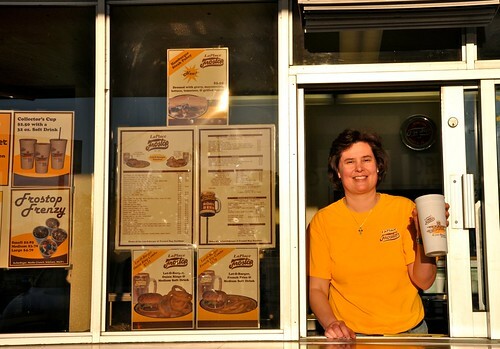 Since we knew we were short on time we asked the Tolers what their best sellers were, and found out that they are famous for their root beer and their Lot-O-Burgers. Yes please! Since we were just half an hour north of Louisiana, I opted to get a shrimp po-boy, and RetroRoadhusband pretended to be healthy and also ordered a green salad with their Honey Gold dressing. Can you tell we were famished from our drive?! While RetroRoadhusband sat at our table inside, I wandered around to take some photos in the glorious warm sunlight. I was pleased to hear our number called out, so I returned inside and in moments our table was laden with more food than we realized we ordered! 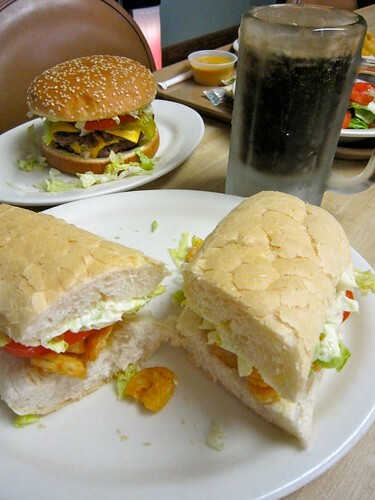 Our eyes were definitely bigger than our stomachs in this case, but I dug into, and dug, my sandwich immediately. RetroRoadhusband gave his his Lot-O-Cheeseburger with Lettuce, Tomato, Mustard,Mayo,Pickle,Onion the thumbs up and ate most of his salad with the dressing. And this is a cool detail that I was surprised but pleased to see – since we were eating in the dining room we had real plates and silverware, not more trash producing disposables. Very retro and very green at the same time. 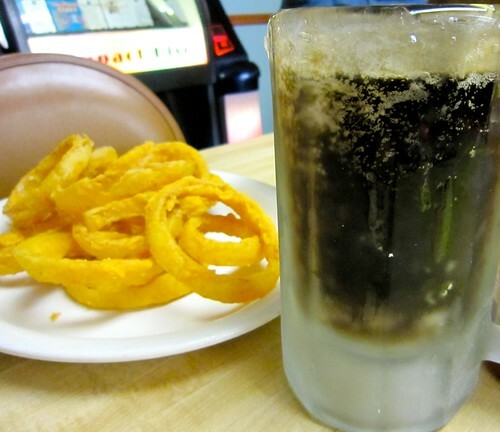 Two menu items that deserve special highlighting are the delicious and icy root beer, served in oversized frosted mugs, and the homemade onion rings. I am telling you, I don’t know what it is, but these were the most tasty onion rings I have had in ages. Sweet onions, light and crispy coating, not too greasy, but greasy enough to be flavorful, I was stuffed when we left because I refused to leave any of those onion wonders on the plate. It’s probably good for my waistline that I didn’t buy a bag of their onion ring breading, but it’s good to know I can order it, if the memory of those onion rings comes back to haunt me. But alas it was time for us to get on the road again, so we left with some souvenirs and not an inch in our tummies for their ice cream treats. Though it was well past their posted closing time of 6pm there was a steady stream of customers coming in the door, and each one was greeted with a friendly welcome, even though technically the door could have been locked. Business here in LaPlace had been affected by the storms and hurricanes over the past years, so it was good to see folks still swarming in to support this local landmark. This was definitely a highlight of our trip as well. And talk about Social Media – way to go Terry!